There are many fire alarm panels available on the UK market today. The Safety Centre feature many of the fire alarm panels on offer within our product portfolio. Fire Alarm Panels are designed to have detectors, call points, sounders and interfaces connected to them to create a fire alarm system. The Safety Centre features conventional / non-addressable, analogue addressable, two wire and wireless fire alarm panels within our range. Below is a explanation of the various types of fire alarm panel. 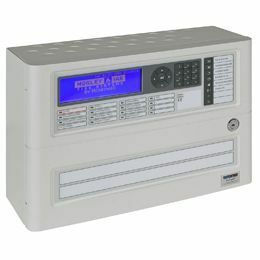 Conventional fire alarm panels are the most simple version of panel. They tend to come in 2, 4 and 8 zone sizes. The zones are designed to have detection devices and call points connected to them via a radial type circuit. These systems have seperate 24V dc sounder circuits, which are designed to accomodate the sounders, sounder beacons, beacons and auxilliary relays to. The main control panel will monitor these circuits for faults and alarm activations. It will also allow the user to control the system via buttons or keyswitches on the front of the panel. Analogue Addressable Fire Alarm Panels are more intelligent fire alarm panels than conventional systems. These systems are wired in loop circuits. These loop circuits are designed to accomodate analogue addressable detectors, call points, sounder, beacons and interfaces all on the same loop circuit. Analogue Addressable Panels will also have a seperate 24V dc conventional sounder circuit which can also be used to connect conventional 24V dc type sounders to if required. Two Wire Fire Alarm Panels are an enhanced version of a conventional type system. they are sized in various zone sizes as with standard conventional fire alarm systems. However they allow detectors, call points, sounders and beacons all to be connected to the same zone circuit. This is a great benifit as it saves installation cost as the materials and installation time is reduced. Wireless Fire Alarm Panels are designed to communicate with wireless fire alarm system devices without the need to install cables between them. This is done by using radio transmission technology. These systems are ideal for listed buildings or systems that need to be installed quickly. Another advantage of this type of system is that it can be used for temporary systems that can be re-used on additional sites. If you’re interested in our fire alarm panels range you may also be interested in our Fire Extinguishers and Fire Blanket ranges.